I got these a while back and have been sitting in my stash along with piles of those paint chip samples. 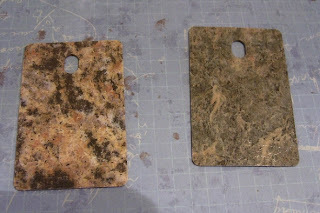 These are samplings of countertops when you want to change your kitchen. They have a nice little hole at the top as well...hmmmm looks like something you could turn into something rather useful. 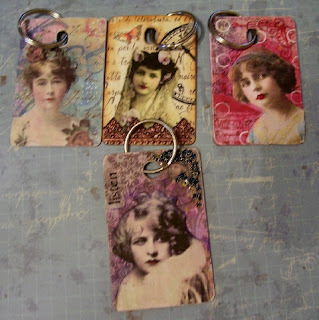 So what I did was turn them into key tags. I used Modge Podge and put a good layer on top of the piece, then I cut a piece of scrap paper just a bit larger than the size of the tag. Put some Modge on the back of the paper as well and then lay on top of the tag and smooth out with your fingers to get rid of any air bubbles. Now put a thing layer of Modge on the top as well, again smoothing out the air if any then set it aside to dry. Make sure that all the corners are glued down, if not lift the corner and put some Modge there and press down and put the tag aside. Drying is important so be patient. Now would be the time to get images, stamps out and any embellies you want to use. I didn't use much in the way of 3-D objects because if these are to be used for keys it will get banged around a lot, but if it is for another idea then go ahead. After the paper is dry, cut carefully around the edges. If the hole at the top is round, take a hole punch and punch it out. If it is oval take a good sharp utility knife and cut around the hole. Try to keep your cuts neat. That is why you want your paper to be dry. Now take either a nail file, or a piece of fine grit sandpaper and sand all around the edges and even carefully around the hole. You just want to see the white of the paper, don't sand so hard you rip the paper. Again you really wanted to let that Modge dry well. Use Modge to apply images, other papers for a collage. If using stamps, stamp wherever you want. Add anything else you might like, words, etc. One of the tags I used Glossy Accents and put some microbeads around the corner. Gives it a nice texture and the GA really adheres them to the paper. Add a key ring, or split ring as I have here and you are done. I think printing an address label and putting it on the back would make great luggage tags, or use for kids knapsacks, gym bags, keys for a friend. Just have fun and best of all these are Free!!!! If you make any and would like to show me please do I hope this has been helpful and given you some inspiration. Those are great, Lesley... they look beautiful and sturdy, too. Might have a Home Depot run in my future! Great idea! This is the first useful thing for these samples that I have seen! Oh my- I love these! I hope there are some left when I eventually get to Home Depot!!! Clever girl, these are great, thanks for the tutorial, and I promise I won't tell at my HD. Love the colours and images. These are fantastic! I remember when they were all the rage a few years ago and I went around to all the hardware stores for "samples" LOL I have a big pile in my drawer - but you have inspired me to get them out again!!!!! I so adore your work.These are scrumptious. Absolutely brilliant idea, genius! They look fab. Such a brilliant idea!! these are so levely! I have some of those too! great idea! They're just gorgeous and, of course, the mind reels thinking of additional applications! I pass a Home Depot on my way to work; and guess where I was at 7:08 this morning? The store had just opened, so I was alone in the home improvement section. LOL - I could have cleaned them out; but I didn't. Now I have a question: Some of the samples are shiny and others are matte. Did you find one or the other better for this technique? Great idea! Love how you finished them too. Thanks for sharing. Oooh ... really love this idea ... think it may be a problem to get hold of the raw material in the UK :( If I find a UK solution - I'll mail you!